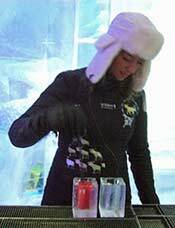 ABOVE: A bartender pours drinks in Icebar CPH. Ron Pattison's guide to beer bars and breweries in the Danish capital is part of a larger European Beer Guide. Chill out in a saloon that's rebuilt each year with arctic river ice from Swedish lapland.